“You’re nuts!” Might be, but then Trad Climbing requires a set of nuts (amongst other things, as you will see), as in this style of climbing you place the protection yourself, instead of relying on pre-installed bolts (as in sport climbing). “Can such a nut hold a fall? you might be wondering. I didn’t plan to try, but then things don’t always go according to plan. 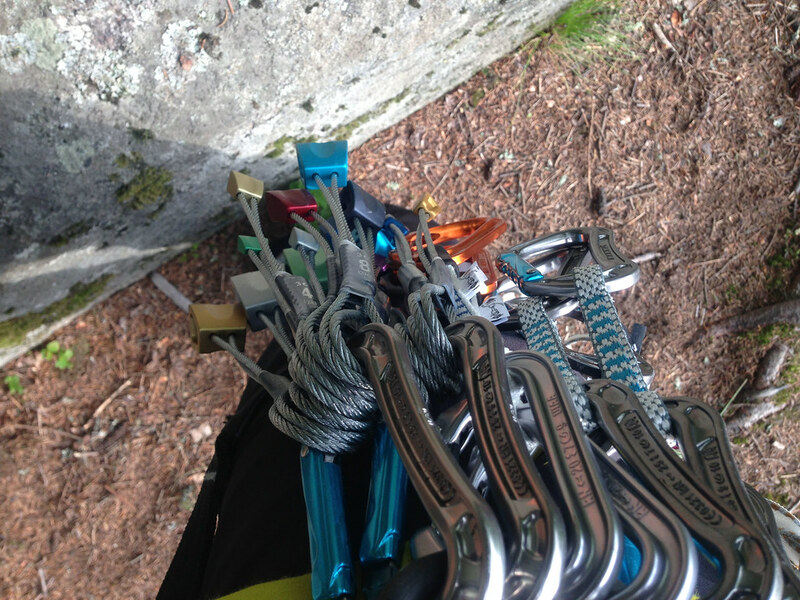 I got my set of DMM Wallnuts, DMM Offset Nuts and DMM Torque Nuts in spring 2013, and had them out on several outings to the local crag and to Havukallio. I carried them along a couple of times to mixed climbs, but sticked to ice. All in all they have been on about seven outings. A Nut is a metal - usually aluminium - wedge threaded on a wire which you place in a crack on your climb. You then clip a Quickdraw into the nut’s wire, and clip your rope through it. They’re know as passive protection, as there is no moving parts (well, you can move the steel wire a bit, as well as the Dyneema cord, but really, they’re passive) - as opposed to active protection like Cams, which have moving parts. 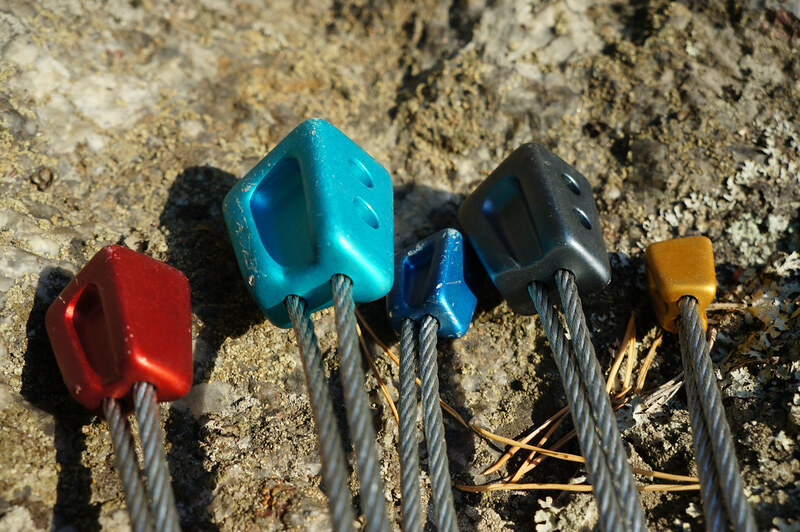 Available in 11 sizes for the Wallnuts, five sizes for the Alloy Offsets and four sizes of the Torque Nuts, the first two sets are colour coded for easy recognition (it pays off to practice with them at the bottom of the crag and learn which colour fits which size of crack), and are compatibility with other brands, too. The Torque Nuts have a double dyneema sling which can be extended, while the larger nuts have holes in them to make them lighter. Take a look at these three videos, which explain them pretty well. All three sets are Made in Wales, and have undergone much trying and testing on the cliffs and crags of Snowdonia before ending up in our hands. The Wallnut shape has been enhanced by adding a scoop to improve security in shallow placements, which does work well, and the sizes generally match well, as you could see in the above video. Really smart ist the extendable Dyneema sling on the Torque Nuts: Keep it short at the base, extend it further up to reduce rope drag or when placing it deep in a crack. The quality is superb, as you know it will be from DMM. In the big picture, Nuts from Black Diamond, Wild Country, CAMP and DMM weigh pretty much the same. Some companies have a couple of larger or smaller sizes so a set will weigh more, but overall a modern standard rack will be the same weight. And the DMM Nutbuster is 54g. Which makes the whole passive protection part of the Trad Rack™ 1.046 g.
DMM manufactures their Nuts in Wales, which makes the transport to us in Europe short. Aluminium and steel, the main ingredients of the Nuts, can be easily recycled - just drop them at your scrap yard, and depending on the size of your rack you even might get enough money to go buy a pint in the pub. Of course Aluminium has a large electricity footprint, but the alternative would be to climb free solo. While DMM doesn’t lose a word about possible sustainability programs they adhere to, they have a page on their Quality management. After watching several videos on how to place nuts I took my shiny new gear to the crag and started placing them, to get a feel for which colour fits into which width of a crack. The learning was pretty straight forward, so upwards I went. The placing of the nuts while being 15 m high was, thanks to having practiced it, fairly simple. Of course it’s slightly more challenging to place a piece of gear when you’re keeping yourself up with one hand, search with the other hand for the right size of nut, unclip it from the ‘biner, add a QD and then clip the rope. But it’s just a question of training a far as I am concerned. The colour-coding helped me well to find the nut I needed quickly - “That crack looks like a red offset”. And then the opening question: Can a Nut take a fall? Yes, it can (if well placed). On the last climb of the weekend at Havukallio, some 2 meters from the top out I slipped about a meter above my last placement and took a fall of around three meters. The Nut and Cam held like a bomb, and while I was startled I was happy that my placements held. It helps to build up trust in your [placement] skills, and probably makes you a better climber. Although I rather wouldn’t have fallen, and just topped out. Even when I thought I placed a nut well, it has happened that one has moved out of the crack. This was more the case with the regular Wallnuts than with the Offsets, but could really have been just a case of “sloppy placement”. Or that the rope drag played the nut loose. This isn’t a big deal on relatively safe routes, but could be a serious safety concern on run-out routes. In that case either make damn well sure your placement is bomber, or use a piece of active protection. You can have a whole rack of Nuts from many different manufacturers. Black Diamond, Wild Country, CAMP, Climbing Technology and Metolius all make various kinds of Nuts. I chose DMM because they’re Made in Wales, are high-quality, and are very light. And the complete set is fairly affordable, too. UK Climbing rates the Alloy Offsets as good (probably very good now that they’re “fixed”). The DMM Wallnuts received 4.68 out of 5 Stars at rockclimbing.com and also the Outdoor Gear Lab rates them very high. If you’re planning to start Trad Climbing this year, you can not go wrong with set of DMM Wallnuts, Offset Nuts and Torque Nuts. 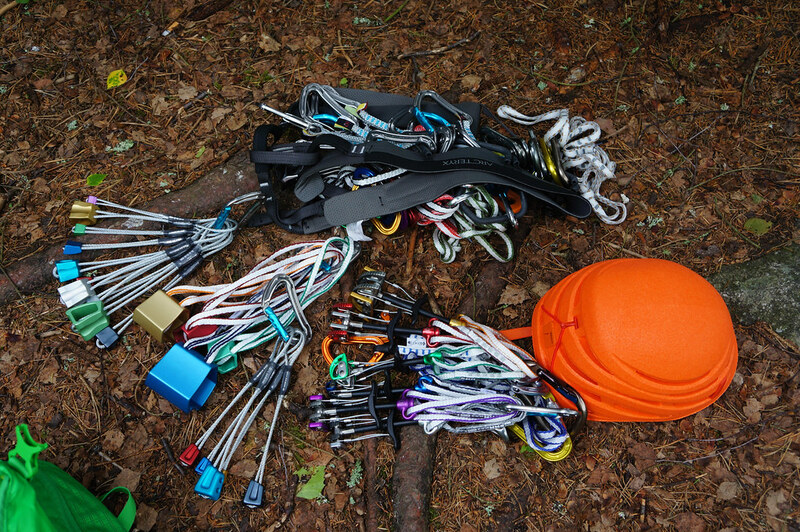 While the latter is here in Finland not that often needed, a basic set of Nuts is THE key ingredient to your Trad Rack™. Getting the DMM Wallnuts and Offset Nuts gives you all the passive protection you’ll need to start practicing traditional climbing and lets you find out what you should get next. The DMM Nuts are high quality, lightweight, Made in Wales, and look pretty damn sweet. Though that’s only while they’re new, so go climbing & get them scratched up!